Rumor has it that Treyarch's rumored Cold War/Vietnam Call of Duty is rumored to come out in November 2010, with Activision intending to corner the holiday season for a fourth straight year - or so rumor says, anyway. 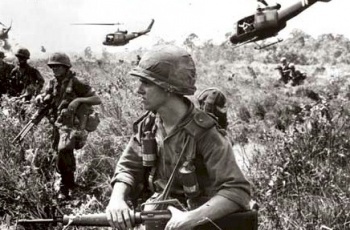 There's been no actual confirmation that secondary Call of Duty developer Treyarch is working on a game set during the Vietnam War era, but at this point the circumstantial evidence is mounting so high that I'd be honestly surprised if it turns out to not be the case - which, of course, is still a possibility. Noah Heller told OXM UK that the studio was finished with World War II, Activision was reportedly licensing Vietnam-era music, and Treyarch has been looking for a history buff for the next game in the series. Now, a "senior UK trade source" reportedly confirmed to CVG that the Treyarch-developed seventh Call of Duty will indeed be set during the late 1960s in the Vietnam War, taking cues from classic films like Apocalypse Now and Platoon. CVG's source also said that publisher Activision-Blizzard has mandated that the title be ready to launch in November, to "own Christmas 2010, just as it has in the last two years. " By my count, actually, that would be the last three years, as Infinity Ward's Call of Duty 4: Modern Warfare, Treyarch's own World at War, and IW's mammoth Modern Warfare 2 all came out in November of 2007, 2008, and 2009 respectively, and all three were massive, massive hits. So even if this weren't all that reputable a source, the idea that November 2010 would see a new CoD for the fourth year running is hardly an uneducated guess. "Development is on course - and Treyarch have been told the game must be ready to hit shelves before the gifting season," said the source, though Activision declined to comment. Will there be moral ambiguity and drug addiction ahoy for Treyarch this November? Our Magic 8-Squall says "...whatever." We'll take that as a yes.